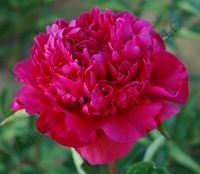 Red, bomb-type double, early-midseason, very fragrant, 36" tall, lactiflora. Large guard petals frame the bomb center. Opens well on stiff stems. Good in hot climates. 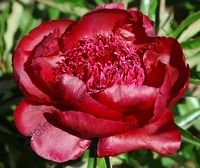 Extremely dark red, semi-double, lightly fragrant, early, 30" tall, hybrid. 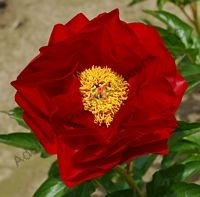 Very dark chocolate-red petals are sprinkled with golden stamens. Striking maroon fall foliage! Award of Landscape Merit 2009. APS Gold Medal 2010. Scarlet, single to semi-double, midseason, 33" tall, hybrid. Scarlet petals cupped around a small yellow center. 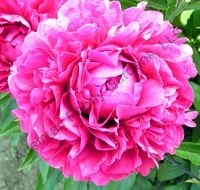 Nice cut flower with brilliant color. 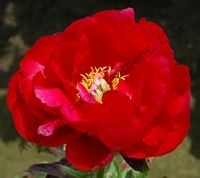 Scarlet red, semi-double, lightly fragrant, midseason, 34" tall, hybrid. Striking color on a vigorous plant that is upright. Petal numbers may increase with plant maturity. 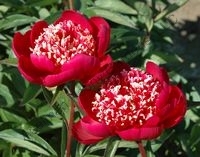 Red, double, fragrant, midseason, 30" tall, hybrid. 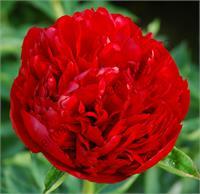 A bright red tight bloom that stands upright on a strong stem. Rarely sold. Red, single, midseason, 20" tall, hybrid. 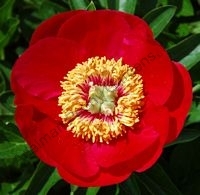 The brilliant, true red petals surround golden stamens for regal splendor. Makes a nice short border plant. Raspberry Red, bomb-type double, midseason, 32" tall, lactiflora. 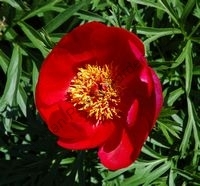 A dependable attractive red flower. Color is brilliant and of even tone with a silky luster. Still popular! 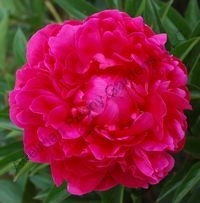 Ruby red, double, lightly fragrant, midseason, 34" tall, lactiflora. 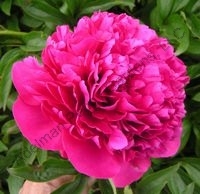 Frothy petals make it an excellent cut flower. Dark green foliage and strong growth habit. 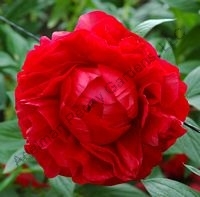 Rich cardinal red, double, fragrant, midseason, 40" tall, hybrid. 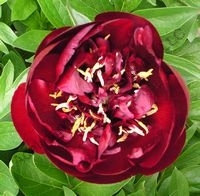 Heavy petal substance with a deep red sheen. Large flowers on long stems. May need support. Creamy red, semi-double, midseason, intersectional, 30" tall. This striking flower fades to a cream while holding its darker center color. Award of Landscape Merit 2009. Chocolate red, japanese, midseason, 36" tall, lactiflora cultivar. 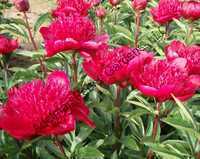 An unusual color combined with an unusual flower form will make a focal point in your Spring flower bed. Cherry red, single to semi-double, fragrant, midseason, 28" tall, intersectional/Itoh. 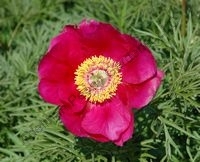 Opens a cherry red fading to orange then yellow, showing 3 colors of flowers on the plant. Excellent garden plant. Red, double, fragrant, midseason, 36" tall, lactiflora. Rose-type flowers of watermelon-red on strong dark green stems. APS Gold Medal Award 1957. Red, single, lightly fragrant, very early, 12"-18" tall, hybrid. The finely cut leaves and dwarf stature of this plant are a result of a cross between P. officinalis and P. tenuifolia. Red, single, early, 20" tall, hybrid. This plant has a mounding habit with finely cut foliage. 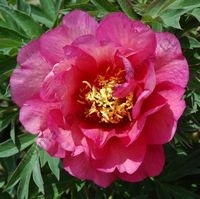 Good in the rock garden or as a contrasting foliage border plant. Award of Landscape Merit 2010. Red, semi-double, early midseason, 36" tall, hybrid. 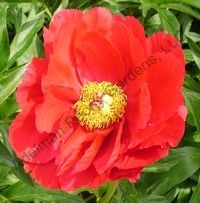 A brilliant red flower that shows up clear across the garden! 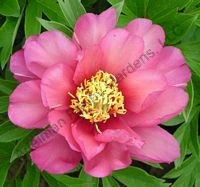 The large silken petals are ruffled adding fullness. APS Gold Medal winner 2013.